Jayne Parker, British Artists Film, film compilation DVD, released by BFI, 2008. Jayne Parker Filmworks 79-00, published by Spacex Gallery, Exeter, 2000, ISBN 09507516 69. Free Show - 16mm, b/w, 16 minutes, 1979. I Cat - 16mm, colour animation, 10 minutes, 1980. RX Recipe - 16mm, colour, 12 minutes, 1980. I Dish - 16mm, b/w, 16 minutes, 1982. Snig - 16mm, colour, mute, 6 minutes, 1982. Almost Out - U-matic video, 105 minutes, 1984. En Route - U-matic video, 15 minutes, 1986. The Cat and the Woman - 16mm, colour animation, 2.5 minutes, 1987. K. - 16mm, b/w, 13 minutes, 1989. The Pool - 16mm, b/w, 10 minutes, 1991. Cold Jazz - 16mm, b/w, 17 minutes,1993. Awarded Certificate of Merit, Chicago International Film Festival, 1995. Crystal Aquarium - 16mm, b/w, 33 minutes,1995. Awarded the Grand Prize of the City of Oberhausen and a ‘Mention Spéciale’ from FIPRESCI at the 43rd International Short Film Festival Oberhausen 1997. Collection: Arts Council, England. The Reunion - 16mm, colour, 9 minutes, Dance for Camera ACE/BBC, 1997. Thinking Twice - 16mm, b/w, 10 minutes, 1997. 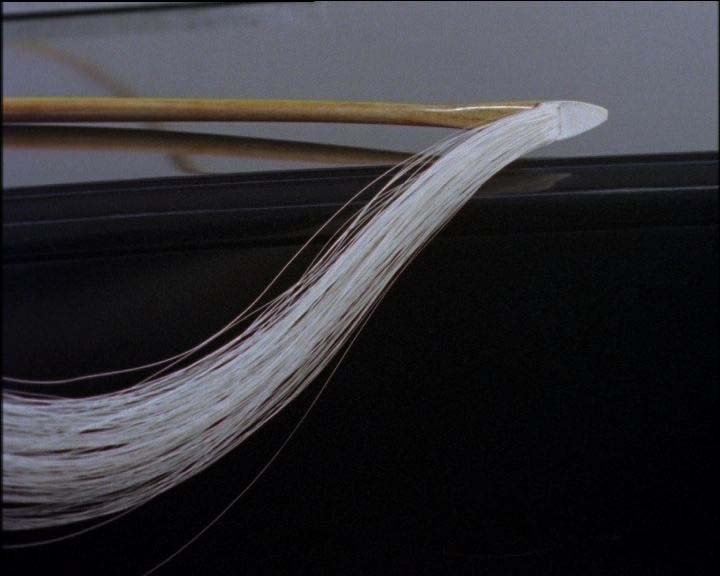 The Whirlpool - 16mm, colour, 7 minutes, 1997. Strong Women - 16mm film, b/w, 15 minutes, 2000. 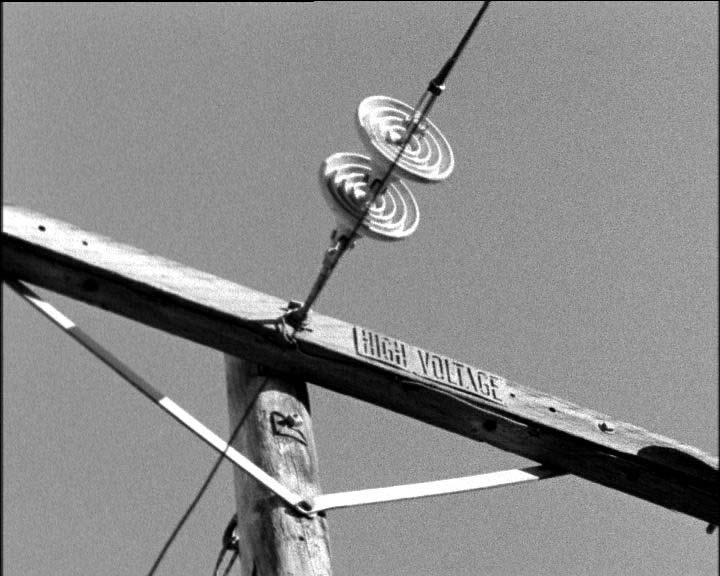 Foxfire Eins - Digibeta from original 16mm, b/w, 10 minutes, 2000. Blues in B-flat - Digibeta from original 16mm, colour, 8 minutes, 2000. Collection: Museion, Bolzano, Italy. Stationary Music - Digibeta from original 16mm, b/w, 15 minutes, 2005. Awarded the ARTE Prize at the 51st Oberhausen International Short Film Festival 2005 & an Honourable Mention at Media City Film Festival, Windsor, Ontario, Canada in 2006. 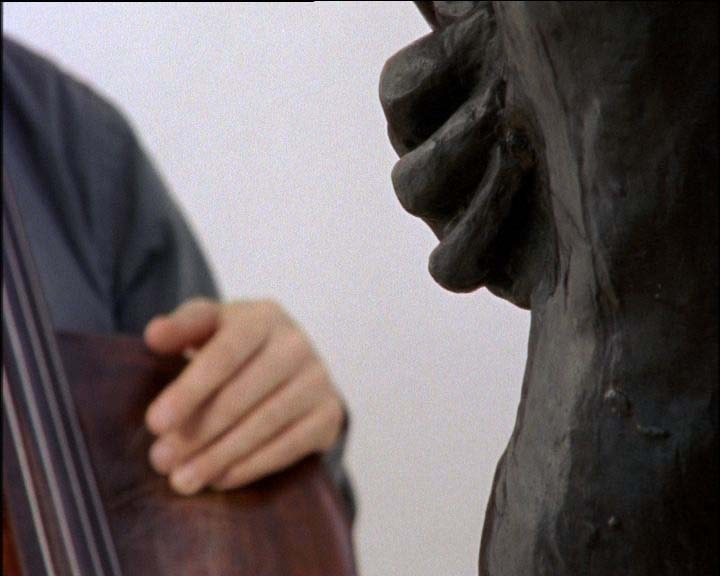 Catalogue of Birds:Book 3 - Digibeta from original 16mm, b/w, 15 minutes, 2006..
Trilogy: Kettle's Yard: Linear Construction - Woman with Arms Crossed - Arc - Digibeta from original 16mm, b/w & colour, 25 minutes, 2008. Received an Honourable Mention at Media City Film Festival, Windsor, Ontario, Canada in 2009. ...but the clouds... - DVD, 15 minutes, with John Tilbury, Samuel Beckett's 1976 play for television, 2009. Over the past few years my major research has centered round the relationship between music and film and the search for a 'music equivalent'. To this end I have made several films featuring musicians, in particular with pianist Katharina Wolpe and cellist Anton Lukoszeviesze. Considering music helps me to think about film structurally. It presents challenges: how can I reflect the form and rigour of the music? Can film embody music? Where is music expressed? Does what I see change what I hear? I am fascinated by the act of playing, of touch, and the moment when someone becomes the performer. While still choosing to take the act and site of musical performance as my primary source of imagery, I am exploring ways of introducing other imagery, to interrupt the ultimate linearity of the score in performance and expand the filmic possibilities. Before I went on to study at the Slade, within what was then the Experimental Media area, I studied sculpture at Canterbury College of Art. 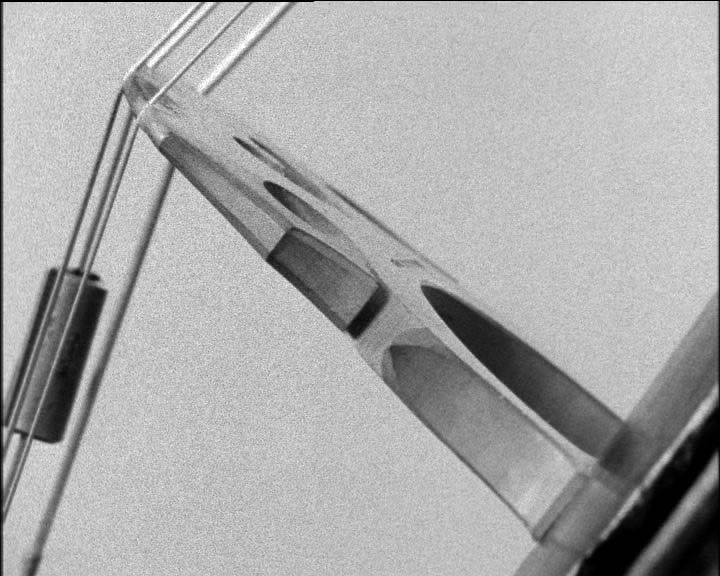 My interest in material, the actual, the physical - is perhaps responsible for my abiding interest and commitment to working primarily with 16mm film (although most of my recent musical performance works are finished digitally because of the sound quality). This last year or so I've started making objects again. Photography, although secondary, has always run alongside my film-making. I have been teaching at the Slade since 1989 and was appointed as Head of Graduate Fine Art Media in 2010.
International Festival of Film and Digital Art, Windsor-Detroit, Canada. Film 'The Oblique' (2018) screened in the International Competition. Media City, in its 23rd year, is an annual international festival of film and video art presented in Windsor, Ontario and Detroit, Michigan. Each year the festival attracts filmmakers and audience members from around the globe to participate in several days of screenings. The exhibition MOTHERS is a collaboration between mothers and their children, curated by Dyveke Bredsdorff and Bronte Dow. Video 'Almost Out' (1985) screened. Installation of film The Oblique (2018) and photographic work: Magnolia in cello. Exhibition curated by Sandie Macrae and Aileen Morgan. Festival premiere of 'The Oblique' digital transfer from original 16mm film, colour, 10 minutes, 2018 Programmed in the International Competition. The 14th edition of AVANT focus on bodies and boundaries. The body is both our most private territory and a social interface, a boundary that both divides and unites. The point of departure of AVANT is in one of the most legendary artists when it comes to the socio-political dimensions of the body, VALIE EXPORT, followed by Jayne Parker's early performance-based films. The theme of the body and its boundaries, as social body and embodiment of inner states and feelings, is followed up by focusing on external mechanisms of making boundaries; fences, border controls and the politics of immigration. The theme is introduced through the premiere of Gunvor Nelson's latest film, ON THE FENCE, and concludes with a program by artist duo Minna Rainio and Mark Roberts. AVANT begins on Friday evening at Kristinehamn Art Museum by artist talks with VALIE EXPORT and Jayne Parker. Saturday opens at cinema Arenan in Karlstad with a screening of films and videos by VALIE EXPORT and Jayne Parker. After this follows two works by Gunvor Nelson and a program with videos by Minna Rainio and Mark Roberts. AVANT has been organized since 2002 and the 14th edition is a collaboration between Världsalltet, Kristinehamn Art Museum, Karlstad and Stockholm University. AVANT17 is sponsored by Karlstad University, Karlstad Municipality, Kristinehamn Art Museum, Region Värmland, Folkuniversitetet and the Swedish Film Institute. Friday/Fredag 8.9. Kristineham Art Museum/Kristinehamns konstmuseum 18.30 Opening/Öppning Artist talk with VALIE EXPORT and Jayne Parker. Saturday/Lördag 9.9. Karlstad Biograf Arenan/Karlstad Cinema Arenan 10.00 VALIE EXPORT Selbsportrait mit Kamera (1966-67) 1 Interrupted Line (1971-72) 6 ...Remote...Remote... (1973) 10 Mann, Frau & Animal (1973) 8 Body Politics (1974) 3 Syntagma (1984) 20 I turn over pictures of my voice in my head (2008), 11:30 11.30 Jayne Parker Freeshow (1979) 15 I Cat (1980) 10 I Dish (1982) 15 K (1989) 13 The Pool (1991) 10 14.00 Gunvor Nelson Moons Pool (1973) 15 ON THE FENCE (2017) 58 15.30 Minna Rainio and Mark Roberts Borderlands (2004) 24 Angles of Incidence (2006) 14 Eight Rooms (2008) 15 The Factory of the World (2014) 8 Founded in 2002 John Sundholm, AVANT is Sweden’s first international event entirely focused on experimental film. Programmed by John Sundholm. Club des Femmes at Fringe! Video 'Almost Out' (1984) screened. Joint screening and discussion with film maker Maja Borg, programmed and chaired by Sarah Wood. Part of the 50th anniversary celebrations of the London Film-Makers’ Co-op, curated by Maud Jacquin. A series of screenings and discussions dedicated to the women filmmakers of the LFMC As part of the 50th anniversary celebrations of the London Film-makers’ Co-op (LFMC), Tate Modern opens its Counter-Histories series with a programme dedicated to a rarely seen but remarkable ensemble of films – both single screen and expanded – made by women filmmakers since the 1970s in the context of the artist-led, cooperative organisation. Produced against a backdrop of growing feminist consciousness, these films built on the methods, processes and ethos associated with the Co-op to address the world outside of the projection room. Programme 'Collapsing the Frame' Friday 23 September Opening night of the Tate Film series From Reel to Real: Women, Feminism and the London Film-makers’ Co-operative ​ The filmmakers in this programme experiment with film structure in an attempt to collapse the frame within which women are confined, both cinematic and cultural. Their films evoke feelings of entrapment and oppression at the same time as they enact a radical attack on patriarchal authority as embedded in both social and filmic conventions. In particular, they express a categorical refusal to submit to the masculine gaze, either by opening up the possibility of reciprocal looking or by avoiding female representation entirely. Sally Potter, Jerk, UK 1969, 8mm transferred to digital, black and white, silent, 3 min Jayne Parker, I Dish, UK 1982, 16mm, black and white, sound, 15 min Nina Danino, First Memory, UK 1981, 16mm transferred to digital, colour, sound, 20 min Sarah Turner, One and the Other Time, UK 1990, 16mm transferred to digital, colour, sound, 5 min Alia Syed, Unfolding, UK 1988, 16mm, black and white, sound, 20 min Tina Keane, Faded Wallpaper, UK 1988, 16mm, colour, sound, 20 min ​ Jean Matthee, Neon Queen, UK 1986, 16mm, colour, sound, 40 min (extract 25 min) Please note that this film contains pulsations of light The screening is followed by a discussion with Nina Danino, Jean Matthee, Jayne Parker and Alia Syed, moderated by the series curator Maud Jacquin. Programme 'Inside Out' Saturday 24 September: A screening examining film as a plastic space of subjective projection Resolutely non-verbal, the films in this programme rely on the power of the moving image to give visible presence to profound, intangible inner feelings. The desires, fears and fantasies that constitute subjective experience are externalised both onto the performers’ bodies and into the filmic space, which becomes at once intensely personal and symbolic. Most of these films lend flesh to the ambivalent emotions involved in the relationship to an ‘other’. Jayne Parker, K, UK, 1989, 16mm, black and white, sound, 13 min Jayne Parker, The Pool, UK, 1991, 16mm, black and white, sound, 10 min Moira Sweeney, Looking for the Moon, UK, 1995, 16mm, black and white, silent, 7 min Tanya Syed, Delilah, UK, 1995, 16mm, black and white, sound, 11 min Tanya Syed, Chameleon, UK,1990, 16mm, black and white, sound, 4 min Sarah Pucill, Swollen Stigma, UK, 1998, 16mm transferred to digital, colour, sound, 21 min Cordelia Swann, Phantoms, UK, 1986, Super 8 transferred to digital, colour, sound, 18 min The screening is followed by a discussion with Jayne Parker, Tanya Syed and Cordelia Swann, moderated by Cécile Chich, independent researcher and former board member of LFMC/LUX. In conversation, part a year long series of monthly events marking the 50th Anniversary of the London Film Makers' Cooperative. Curated by LUX and Tate Britain. Films screened: Blues in B-flat - Digital transfer from original 16mm, colour, 8 minutes, 2000. Trilogy: Kettle's Yard: Linear Construction - Woman with Arms Crossed - Arc - Digibeta from original 16mm, b/w & colour, 25 minutes, 2008. 'Piano Performance for Tania Chen' Digital video, 19 minutes, 2016, made in collaboration with artist Joan Key, screened as part of Contact Festival. Contact Festival was programmed by Simon Payne and Andrew Valance and funded by Arts Council England. ​ The Contact Festival included the work of over 70 artists and filmmakers, featuring single-screen films, multi-screen/performance-related works and site-specific installations. Accompanied by a publication including discussion pieces by Luke Aspell and collective-iz (on collective practices), Sally Golding, James Holcombe and Cathy Rogers (on different manifestations of contemporary expanded cinema), and short essays by Maria Palacios Cruz (LUX, Deputy Director), William Fowler (BFI, curator of artists' moving image) and Nicky Hamlyn (filmmaker and writer), plus complete listings. Artists: Laura Hindmarsh, Kerry Baldry, David Leister, Oliver Bancroft, Bea Haut, Jenny Baines, Karolina Raczynski and Anita Konarska, John Smith, Nick Collins, Sally Golding and Spatial, Emily Richardson, Patti Gaal-Holmes, Jennet Thomas, Stephen Littman, Nicky Hamlyn, Simon Payne, George Barber, Maria Anastassiou, Jayne Parker and Joan Key, Jennifer Nightingale, Amy Dickson, Mary Stark, Małgorzata Drohomirecka, Samantha Rebello, Anna Thew, Karen Mirza and Brad Butler, Malcolm Le Grice, James Holcombe and Secluded Bronte, Lynn Loo, Guy Sherwin, Hilary Koob-Sassen, Luke Aspell, Marek Budzynski, Adam Kossoff, Savinder Bual, Matthew Noel-Todd, Heather Phillipson, Daniel Brackenbury and Joe Gilmore, Andrew Vallance, Ben Rivers, Duncan Reekie, William Raban, Deniz Johns, Francesco Tacchini and Oliver Smith, Steven Ball and Martin Blažíček, Andrea Luka Zimmerman, Lis Rhodes, Laura Wilson, Karel Doing, Vicky Smith and Bouche Bée, Greg Pope and Kostis Kilymis. Exhibition curated by Sandie Macrae and Aideen Morgan. Presentation of films: 'Thinking Twice' and 'Stationery Music' at the invitation of the Stefan Wolpe Society. The Stefan Wolpe Society presents: STEFAN WOLPE – FOUR PORTRAITS OF A VISIONARY. Music by the composer and his circle. Second concert: 'The Quest for New Language' Wolpe: Suite im Hexachord 1936; Battlepiece for Piano 1943-7; 6 Yiddish Folksong Arrangements 1925. Matthew Greenbaum, You Crack Me Up. Musicians: Re’ut Ben-Ze’ev, mezzo soprano; ToniMarie Marchioni, oboe; Moran Katz, clarinet; David Holzman, Margaret Kampmeier, piano. In Memory of Katharina Wolpe: Two films by Jayne Parker of Katharina Wolpe performing piano music by her father: 'Thinking Twice' (1997): Piece of Embittered Music, from Zemach Suite 1939; Displaced Spaces, Studies, Part I 1946; Form for Piano (1959). 'Stationary Music' (2001): Stehende Music (1925). Commentary by Jayne Parker and Austin Clarkson. Exhibition curated by Irena Kalodera and Vicky Falconer. Video 'Almost Out' (1984) screened as part of the film season: 'Portrait in Film' at the National Portrait Gallery, London, programmed by Ben Pritchard. Followed by discussion. 'Bird': digital transfer from original 16mm film, b/w, 10 minutes, collaboration with singer Loré Lixenberg, 2012. The film version was installed in the gallery, and the performance version was played as part of a live performance by Lixenberg. Autumn Almanac: The Voice and the Lens, 8-11 November is a festival and exhibition exploring the treasures of the human voice, conjured up for our eyes through film and performance. Commissioned and curated by Sam Belinfante and Third Ear. Film 'K.' (1989) in exhibition SOLO, an exhibition of film, video and performance at Electro Studios Project Space, St Leonards, and part of the Coastal Currents Visual Arts Festival, curated by Louise Colbourne. This exhibition celebrates music and its harmonious and historic relationship with visual art. Using paintings and objects from York Art Gallery's outstanding collections, it considers the role of music in abstract art, symbolism of music and representations of performance. The works, spanning over 350 years of art, are by artists including Bridget Riley, Juriaan van Streek, LS Lowry, Walter Greaves, Elizabeth Fritsch and loans from contemporary artists Jayne Parker and Jon Thompson. Royal Academy of Art: Summer Exhibition, invited artist. Film 'Trilogy: Kettle's Yard' and a new photograph presented in the Small Weston Room, this is the first time that a gallery in the Summer Exhibition has been devoted to a film work by one artist. Accompanying catalogue. A group exhibition of artists who have exhibited at R O O M.
The Whirlpool shown in the context of: »Seit ich ihn gesehen« - Reflexionen zu Robert Schumann in der Kunst - a last minute addition to the exhibition. Film 'The Reunion' screened as part of the programme 'Opera', an Artprojx presentation in 'Film/Video/Performance' a month long exhibition: 'bringing together documentary, film, animation and performance, as well as live events and discussions on climate change, human rights and arts and disability.' Coordinated and produced by Terry Smith, Teaching Fellow in Drawing, Wimbledon College of Art. 'Trilogy: Kettle's Yard' installed in the house at Kettle's Yard, Cambridge where it was filmed accompanied by an installation of two objects. Film: Trilogy: Kettle's Yard, comprising 'Linear Construction', 'Woman with Arms Crossed' and 'Arc'; two sculptures; three photographs. Selected for festival programme 'A Sense of Space', part of the Experimenta section of the BF1 52nd London Film Festival. 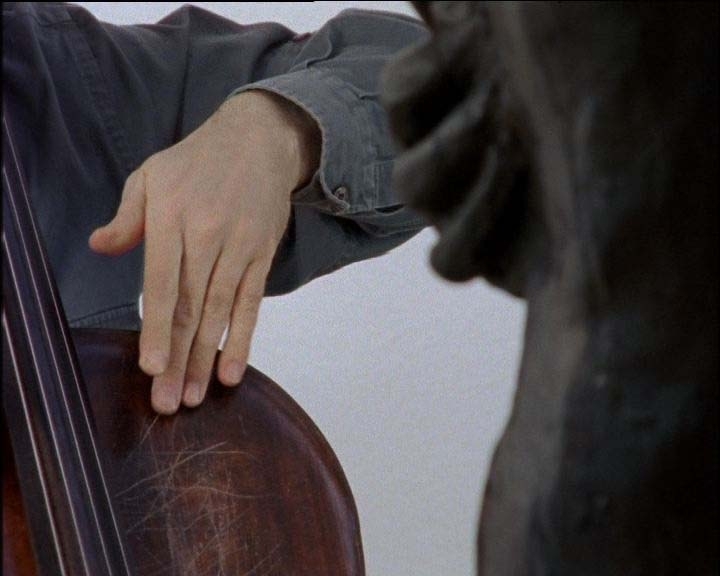 Synopsis: 'Linear Construction', 'Woman with Arms Crossed', and 'Arc' form a trilogy of films set in Kettle's Yard, University of Cambridge, and featuring cellist Anton Lukoszevieze (New Music Fellow at Kings College Cambridge). 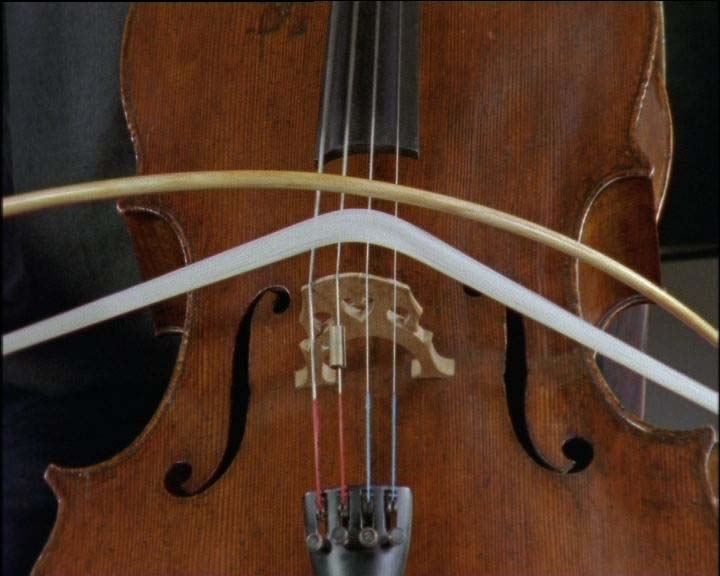 These films are documents of musical performance: respectively 'Récitation' (1980) by Georges Aperghis; 'Sensitivo, per arco solo' (1959) by Sylvano Bussotti; and 'Raimondas Rumsas' (2002) by Laurence Crane. They include art objects from the Kettle's Yard collection, opening up metaphorical space and meaning. For Zoo Art Fair 2007 no.w.here initiated a new project called Instructions For Films. Instructions For Films investigates how a film could be made, using only the idea of film. Over forty international artists who use the moving image, were sent a white card with the following invitation: 'On the card enclosed propose instructions for a film. You may render the instructions by any means and appendages.' The cards were exhibited on no.w.here's stand during the fair, and a published edition is available for purchase. This exhibition opens the New Curtois Gallery at The Collection linking archaeology and contemporary art. Wunderkammer: The Artificial Kingdom is curated by the artist Edward Allington in co-ordination with Jeremy Webster the Senior Keeper at The Collection. The exhibition will also be accompanied by a full colour catalogue with an essay by Edward Allington. Wunderkammer: The Artificial Kingdom is an exhibition about the difference and similarity of art and archaeology, both historically and symbolically. They are both ways of understanding our place within the world. Museums started with collections of objects which evoked the wonder of life. Assemblages of historical and natural curiosities were arranged in glass cabinets to arouse aesthetic pleasure and curiosity. They were part of a fascination with the unknown that we now call science. These cabinets were known as 'Wunderkammer' literally meaning 'cabinet of wonder'. The exhibition aims to mirror the archaeological collection that the new museum has been built to house, whilst celebrating the way artists continually reinvent the world by creating 'worlds within the world'. 'Foxfire Eins' series, installed for the inaugural Berwick Film and Media Festival: Crossing Borders. Artist Film & Video Programme, selected by David Thorp. Berwick Film & Media Arts Festival is an international celebration of the art of film, set in the historic border town of Berwick-upon-Tweed. The inaugural Festival took place in September 2005, with a vision to transform Berwick into one big moving image installation – a visual and cultural spectacle – and the celebration has taken place every year since. Curated by David Thorpe 'Faltering Flame brings together over twenty British artists all of whose work considers the ephemeral and elusive nature of life; those things that we sense about ourselves but that are normally invisible. Our sense of self, our psychological, social and philosophical interaction with reality made tangible and visible through art.' Faltering Flame was the first contemporary exhibition staged at the Graves Art Gallery, Sheffield. Tate Britain 19 May 2003 – 1 April 2004 The use of film and video by artists in Britain over the past decade has attracted much attention. However, artists have worked with film and video in this country from the beginning of the twentieth century and now, for the first time, Tate Britain aims to explore this history. An ambitious series of display of 170 works by 130 artists aims to reveal the full range, variety and originality of this history, from films made close to the cinema’s birth in the 1890s to work realised at the start of the twenty-first century. Many of the works have not been seen before in a gallery context, and some have not been seen publicly since their first screenings. The displays bring together a wide span of artists from early filmmakers such as Humphrey Jennings and Norman Mclaren to recent Turner Prize winner Steve McQueen, and key conceptual and structural filmmakers of the 70s, scratch video artists and super8mm romantics inspired by Derek Jarman in the 80s. The first of four day-long sequences will start at Tate Britain on 19 May. Each programme will be shown at Tate Britain for a period of three months (Prog 1: 19 May - 10 August 2003, Prog 2: 11 August - 2 November 2003, Prog 3: 3 November - 25 January 2003 Prog 4: 26 January - 16 April 2004) and a related series of longer films by British artists will be shown on Sundays in the Clore auditorium. Within each day-long programme the films and videos have been clustered in shorter thematic and historical groups which suggest continuities of interest and approach across generations: film’s ability to encapsulate the everyday and to mimic memory; the challenges of portraiture and the creation of visual music. Other groupings reflect the ways in which artists have explored video and film at particular moments: the early 1970s, when conceptual filmmaking emerged and, in parallel, artists at the London Filmmakers’ Co-op focused on the materials of their medium; the 1930s, when a committed avant-garde worked on the margins of the mainstream industry; and the early 1990s, as artists began to respond to the possibilities of digital editing. A Century of Artists’ Film in Britain has been curated by David Curtis and is an Illuminations production for Tate, with the support of Central St Martins, the AHRB Centre for British Film & Television Studies, the LUX and the British Film Institute. Choreographed by Anthony Howell, accompanied by John White’s melodic palindromes and directed by Jayne Parker, The World Turned Upside Down is an episodic dance of bizarre inversions and reversals between people and dogs. Are the dogs performing for the people or are the people performing for the dogs? The World Turned Upside Down is a ‘Dance for Camera’ film, commissioned by the Arts Council and BBC and produced by Sally Thomas for Maya Vision International. Installations from the Collection MUSEION. 'Blues in B-flat' purchased. 'Foxfire Eins' is a solo exhibition co-commissioned by Spacex Gallery, Exeter, and Film and Video Umbrella. Featuring the cellist Anton Lukoszevieze, 'Foxfire Eins' presents a group of films, which explore the relation between music and film. A monograph, Jayne Parker Filmworks 79-00, was published by the Arts Council in 2000 to accompany the exhibition, which toured to venues including John Hansard Gallery, Southampton and the Pump Room, Aldeburgh Music Festival as well as screening abroad. John Hansard Gallery, Southampton; touring to Atkinson Gallery, Street; Storey Gallery, Lancaster; Angel Row Gallery, Nottingham; The Potteries Museum & Art Gallery, Stoke-on-Trent; Laing Art Gallery, Newcastle upon Tyne; Wolsey Art Gallery, Ipswich. Arts Council Collection exhibition toured by National Touring Exhibitions from the Hayward Gallery, London, for the Arts Council of England. The works, drawn from the Arts Council Collection, spanning twenty years of purchasing included paintings, sculptures, installation and lens based works.. Installation of film in Gallery II, pianist Katharina Wolpe plays Stefan Wolpe. 'The Invitation' in 'The Look of Love', a Rear Window exhibition. Curated by Rear Window, the work in ‘The Look of Love’ was commissioned to respond to ‘the idea of Love as a topic of representation’ and, as the catalogue introduction explains, ‘more specifically the Love shared between two adults’. Group exhibition, toured to Spacex Gallery, Exeter, 4/10/97 - 8/11/97. 'The Visible and the Invisible', an InIVA group exhibition, curated by Zoe Shearman and Tom Trevor, 1996. Large-scale contemporary art initiative through a series of satellite exhibitions, installations and events occurring simultaneously in 'non-art sites' in the London Euston area, including St Pancras Parish Church and The Wellcome Trust, London. Body as Membrane, Kunsthallen Brandts Klaedefrabrik, Odense, Denmark, and The Nordic Arts Centre, Sveaborg, Finland. Curated by Chrissie Iles for the Museum of Modern Art, Oxford in 1990, Sign of the Times toured to Europe, by the British Council: Signes des Temps: British Video, Film, and Slide-tape Installations 1980-1990, Centre d'Art Contemporain, La Ferme du Buisson, Paris, France, a decade of moving image work by two generations of British film and video artists. Elective Affinities, group exhibition, Tate Gallery Liverpool. 'Lavish', In the Woods: The Big Screen and Film Gallery Art Film Programme, Latitude Contemporary Art at Latitude Festival, Suffolk. 'Millennium Nomadic': PROGRAM #1 – ‘FROM THE SECRET FILES OF AN IDIOSYNCRATIC FILM CURATOR’ CURATED BY MARIANNA ELLENBERG for Greenpoint, Brooklyn Film Festival, one of three programmes curated as part of the revival of Millennium Film Archives. 'Millennium Nomadic' series of programmes feature works from the current “new era” of Millennium, a time when dozens of artists & filmmakers have joined together to keep this vital space alive. Millennium Film Workshop, the non-profit media arts center and cinema, located in the East Village, has been around since 1965, dedicated to the exhibition, study & practice of avant-garde and experimental film, video, and all technologies of the moving image. Film 'The Whirlpool' shown as part of 'Encompass 360 Digital Dance' was an innovative project which took place between February and July 2012, leading up to performances 19th-21st July 2012. This exciting digital dance project connected people across the world and got them dancing in the run-up to the Olympics. The project worked with hundreds of young people from its base in Shropshire and, via its interactive website, across the globe. The project integrated film and live performance to create a breath-taking show in a huge 21 metre 360-degree digital Cinemax dome, constructed by Igloovision. Pop up cinema, Christie’s South Kensington, group screening curated by Aura Satz, part of 'Supersonix', an Exhibition Road Cultural Group 2012 project, celebrating the art and science of sound'. Part of a three-day international conference (in partnership with the Society for Literature, Science and the Arts Europe) bringing together 300 artists, scientists and practitioners in the field of sonic art and science 21-23 Jun 2012. 'Tomorrow's World': group film programme curated by Graham Gussin and Benedict Drew, for the 2011 Peckham and Nunhead Free Film Festival, London. Film 'Trilogy: Kettle's Yard' selected for the 2nd Australian International Experimental Film Festival, shown in programme: 'Documenting the World, Life and Death'. 'Soapbox', a performance and film event at Sketch Gallery London. Legendary UK pianist John Tilbury presents a homage to writer and poet Samuel Beckett. The concert begins with Beckett's 25 minute radio play Cascando and then ...but the clouds... the 1977 12 minute TV film directed by Jayne Parker. John will also perform some of the late poems of Beckett as well as a solo piano piece based and inspired by Beckett's late novella Worstward Ho. Film 'Trilogy: Kettle's Yard' at Media City Film Festival, 15th Annual Festival of Film and Video Art, Windsor, Ontario. ...but the clouds... - Video 12 minutes 2009, with John Tilbury. ...but the clouds...was written by Samuel Beckett as a television play in 1976 and first broadcast in 1977 on BBC2. The play takes its title from the last stanza of W. B. Yeat's poem The Tower. The script is precise, leaving little room for interpretation. Filming, editing and performance become exercises in following instructions. Beckett has envisaged everything and our role is to carry it out. All the emotion and longing of the central character is expressed in the voice over, and, in our version, in the woman's face. Film 'The Reunion' shown as part of 'Opera' a programme curated by Artprojx. Film 'Foxfire Eins' in SPNM's 'Sound Source' event. One of two films presented by no.w.here as part of SPNM's Sound Source event. Film 'Blues in B-flat', 'Sonic Illuminations'. 'Sonic Illuminations' is a day exploring sound and moving image at BFI Southbank, aimed at practitioners and everyone interested in film and music. The day will include workshops, panel discussions, live events and screenings. Sonic Illuminations focuses on experimental practices ranging from live music with silent film to film inspired by the structure and feeling of music, featuring contributions from Dominic Murcott and the Trinity College of Music Contemporary Music Ensemble, film collective no.w.here, Robin Rimbaud (aka Scanner), Jon Wozencroft, Jayne Parker & Anton Lukoszevieze, Conor Kelly and David Ryan. The final event of the day features Turner Prize-winning artist Mark Wallinger introducing his film The Lark Ascending with BFI Southbank Artistic Director Eddie Berg. Sonic Illuminations is produced by spnm - promoting new music with BFI Southbank, Anthony Reynolds Gallery, Chelsea College of Art, no.w.here and Trinity College of Music. Diversions is Edinburgh’s first festival of experimental film and video, running from 8 - 11 May 2008. This unique new event is presented by Film Studies at the University and Filmhouse. The festival brings together some of the most important experimental film and video works from the 1920s to the present. Over fifty short, medium and feature-length films will be shown, from historical classics to contemporary works from Britain, USA, France and Finland. Media City is an international festival of experimental film and video art presented annually in Windsor, Ontario, Canada since 1994. The festival is a co-presentation of Artcite Inc. (Windsor’s artist-run centre for the contemporary arts) and House of Toast (Windsor’s film and video collective). Each year Media City screens approximately fifty new films and videos in all gauges and formats in its international competition programs. The festival also hosts retrospective screenings and discussions with featured artists and presents installations in Artcite Inc. and other venues. A two-part event of video screenings, 16mm film projection and performance brings together internationally recognised film-makers with artists from Stroud and the South West. Performance is central to much of the work: walking backwards as a way of remembering; re-enacting the painting of a wall onto the projected image; playing the piano as an act of remembrance. Many of the films use song or music: a film with live accompaniment on the saxophone; poetry set to song as the starting point for a sequence of short films. From digital archive to recollections recorded on film, this event explores ideas of memory and its association with place. Two-part film programme of artists' collaborations in performance and dance exploring notions of identity, race and ways of seeing. A touring programme of films launched at the Institute of Contemporary Art, London: screening and panel discussion. Produced by the Independent Cinema Office. The International Short Film Festival Oberhausen is one of the major international crossroads for the short form, unique in the range of forms and genres it presents to the public, and particularly well known for its spotlight on experiments. Premiere of dance film as part of group screening at Ultima Dance Festival, Cinemateket, Oslo, Norway, 8 October 2002. Curated by Magne Antonsen, Norwegian Centre for the Art of Dance. 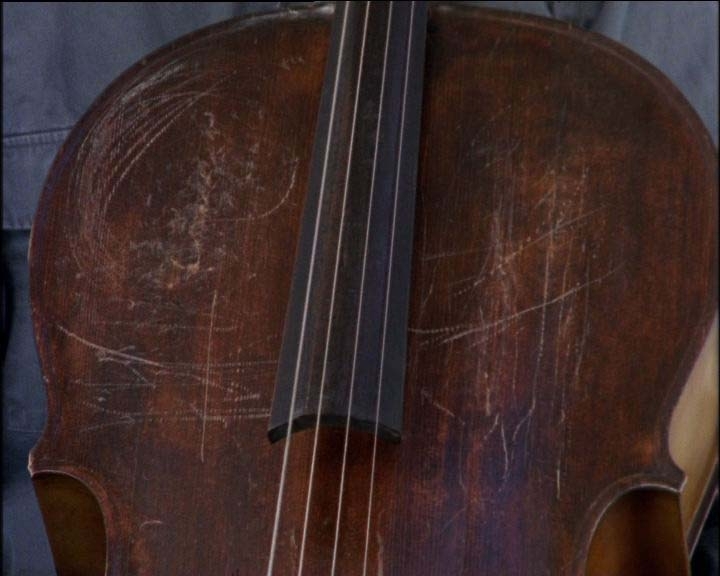 'Man/Cello' an evening music and film with cellist Anton Lukoszevieze and filmmaker Jayne Parker. Joan Key: OB/BO Painter Joan Key (words) collaborates with Jayne Parker (film), Christopher Mansell (music), Anton Lukoszevieze (cello), Lore Lixenberg (voice) and David Ryan (clarinet) on a performance that brings together poetry music and film. The South London Gallery’s live art & film programme is an integral part of its visual arts programme presenting an expanded reflection on performance art through event-based projects involving performance, dance, music, film and video. Works range in scale from intimate collaborations to large theatre-based performance and music often created in response to the gallery space, whilst other projects involve the re-adaptation of existing works in response to the unique setting of the high-ceilinged gallery. 'K.' in 'Illuminating Gestures', group screening. Crystal Aquarium takes its title from the name given to water tanks which were set up on Music Hall stages for underwater performances at the turn of the century. There are four performers in the film - a drummer, a swimmer, an ice skater and a fourth woman. Although the protagonists never appear together they are inextricably bound up by their actions. Meaning is conveyed through movement and its associated sound and the accompaniment of the drummer. The film takes place both above and below water, on ice, and in a room visited by the fourth woman. Crystal Aquarium was awarded the Grand Prize of the City of Oberhausen and a ‘Mention Spéciale’ from FIPRESCI at the 43rd International Short Film Festival, Oberhausen in 1997. It is in the Arts Council Collection. 'Pandaemonium '98', LUX Cinema, London, film and video festival and exhibition. Commissioned by The Arts Council and BBC for Dance for the Camera, and choreographed by Ian Spink, the film 'The Reunion' brings together the dancers Lynn Seymour and Donald MacLeary, partnering each other again, for the first time in over thirty years. 'The Reunion' explores the shifting power relationship between a man and a woman who meet again after a long separation having shared a difficult and troubled past. Commissioned by The Arts Council and BBC for Dance for the Camera, and choreographed by Ian Spink, 'The Reunion' brings together the dancers Lynn Seymour and Donald MacLeary, partnering each other again, for the first time in over thirty years. A group preview screening to an invited audience at the Scientific Societies Lecture Theatre, London, 1/7/97. Arts Council and BBC2 series 'Dance for the Camera Four'. Crystal Aquarium. Film. Shown at 43rd International Short Film Festival Oberhausen, 24-29 April 1997; Odense International Film Festival, Denmark, 12-16 August 1997; Festival of Festivals, Denmark, 25-28 September 1997; PIFF - Pusan International Film Festival 24 September - 1 October 1997. Crystal Aquarium takes its title from the name given to water tanks which were set up on Music Hall stages for underwater performances at the turn of the century. There are four performers in the film - a drummer, a swimmer, an ice skater and a fourth woman. Although the protagonists never appear together they are inextricably bound up by their actions. Meaning is conveyed through movement and its associated sound and the accompaniment of the drummer. The film takes place both above and below water, on ice, and in a room visited by the fourth woman. 'The Whirlpool', 'Smoke Screen - Art for Television' Programme 1, broadcast 30 Nov 1997; NFT2 Southbank Centre 14 Nov 1997; 'Insights 4: The Whirlpool - A case study' The Place, London 30 Nov 1997.
International Competition, 41st Oberhausen International Short Film Festival, Oberhausen, Germany. 25 Years of British Avant-Garde Film Making, Tate Gallery, London. Free Show, I Cat, RX Recipe, I Dish, K., in 'Arsenal: International Film Forum', Riga, Latvia. 'K.' in 'Between Imagination and reality: The ICA Biennial of Independent Film and Video 1990'. 'Almost Out' in 'The Elusive Sign: British Film and Video', Arts Council and British Council International Tour, launched at the Tate, London. The Third Generation: Women Sculptors Today, Drew Gallery, Canterbury Festival, Canterbury. The New Pluralism: British film and video 1980-85, selected by Michael O'Pray and Tina Keane. Surrealist Traces, Film and Video Umbrella tour, launched at the Institute of Contemporary Arts, London. Summer Shorts, British Film Institute film tour, launched at the Metro Cinema, London. Light Years, twenty year celebration, London Film Makers’ Co-op, London. Exciled: A Cinema of Shattering Truths, Film and Video Umbrella tour, launched at the ICA, London. 'The Pool' in 'Arrows of Desire: The 2nd ICA Biennal of Independent Film & Video, international tour launched at the ICA, London 1992. Other (film) in The Fourth ICA Biennial of Independent Film and Video, an international tour. MODERNA BY NIGHT 50 years of the internationally renowned Short Film Festival in Oberhausen 26 November at Moderna Museet, Stockholm Film and video by: Jayne Parker, London, Martín Mejía, Gothenburg, Anna Linder, Cecilia Lundqvist, Michel Wenzer, Sten Sandell, David Stackenäs, Stockholm Films by Martin Arnold, Robert Cahen, Marina Grzinic, Takashi Ito, Matthias Müller, Anna Thew, Jan Verbeek, Marika Orenius m.fl. Curator: Catrin Lundqvist, MM, in co-operation with Reinhard W. Wolf, International Short Film Festival Oberhausen, Filmform and the Goethe Institute. 'The World Turned Upside Down', International Competition, 49th International Short Film and Video Festival Oberhausen 2003. Also, Cinémayence, Mainz, Germany 3 Feb 2004; Milano Film Festival, Italy 11 Mar 2004; Goethe Institute, Tallinn, Estonia 24 Nov 2004. 'Performance, Film, The Body', curated by Aaron Williamson for 'Live Culture' at Tate Modern, London. A Live Art Development Agency Event. 27 March – 30 March 2003 Live Culture is a programme of Live Art performances, presentations and an international symposium. It brings together distinguished artists, theorists and curators to consider the cultural value of ‘live’ art practices in the context of Tate Modern’s Collection Displays and more broadly within the visual arts and other cultural spheres. Contributors include Marina Abramovic, Ron Athey, Franko B, Carol Becker, Catherine David, Forced Entertainment, Tim Etchells, Coco Fusco, RoseLee Goldberg, Matthew Goulish, Guillermo Gómez-Peña, Lin Hixson, Amelia Jones, John Jordan, Keith Khan, Yu Yeon Kim, Oleg Kulik, Alastair MacLennan, Hayley Newman, Peggy Phelan, Andrew Quick, Alan Read, La Ribot, and Henry M Sayre. Sarah Nicolls, winner of the British Contemporary Piano Competition 2000, has commissioned artists to create a multimedia concert exploring the combination of music and film, with premieres by some of Britain's foremost composers. Performing with Sarah will be the singer Lore Lixenberg, Sound Intermedia and film artists Kathy Hinde, Joan Key and Jayne Parker. Visual accompaniment specially created by Joan Key and Jayne Parker for 'Apparition' by George Crumb, performed by pianist Sarah Nicolls and singer Loré Lixenberg. In the context of the exhibition 'Starting at zero: Black Mountain College 1933-1957', a weekend of events: 'John Cage, Lou Harrison, and Stefan Wolpe: celebrating the composers of Black Mountain College', taking place between 10 and 12 March 2006, celebrates Cage, Harrison, and Wolpe's highly individual styles. Performers include Apartment House, radical vocalist Phil Minton, pianist Katarina Wolpe, daughter of Stefan, and award-winning film maker Jayne Parker. 'Signes de Nuit est invité au 11ème FESTIVAL DU CINÉMA EUROPÉEN à Beyrouth / Liban organisé par la Délégation de la Communauté Européenne pour l´ouverture d´un nouveau section de “films de difference”.' Curated by Dieter Wieczorek. Commencing March 8th 2005 Mumbai and coinciding with International Women's Day, before touring to seven of the biggest cities in India, ending April 30th. Tenth Anniversary, The BBC British Short Film Festival. 'Stationary Music', in 'Evolution'. Media Arts Festival, 3-9 April 2006, Leeds. Lumen present Evolution 2006, their fifth series of events, screenings and performances exploring avant-garde approaches to film, video and sound, curated by William Rose and Gregory Kurcewicz. Bristol’s Arnolfini Gallery is showing the UK’s first exhibition about the influential Black Mountain College art movement. The exhibition, Starting At Zero: Black Mountain College 1933-1957, traces the founding and subsequent flourishing of a distinctly American artistic tradition, and runs until January 15 2006. It uses a combination of art works and history to explore the college’s influence, regarded as one of the most important artistic experiments of the 20th century. Black Mountain College was founded in 1933 by John Andrew Rice, a disaffected classical academic. Located in North Carolina, it attracted many major figures in the emergent American avant-garde art scene as well as composers, dancers, architects and writers. These included abstract expressionist painters Robert Motherwell, Willem de Kooning and Franz Kline, composer John Cage and influential architect Buckminster Fuller. Stationary Music screened alongside a documentary entitled 'The Fire Within' by M. C. Richards who studied at Black Mountain College. 'Stationary Music' awarded 'Honorable Mention' by the festival. 'THE SUBJECTIVE CAMERA is a series of retrospective screenings of six film artists whose work examines subjectivity with an analysis of film language. Emerging within the context of the London Filmmaker's Co-op during the '80s and '90s, these artists each developed an independent practice that built on and countered the principals of the Structuralist film movement of the '70s. Retrospective screenings by: Jayne Parker, Nina Danino, Alia Syed, Michael Maziere, Sandra Lahire and Sarah Pucill. 25 April - 30 May 2007. Invited performance within the context of the Haywood Gallery show 'How to Improve the World, Live Art Programme'. Film screening followed by live performance from Anton Lukoszevieze, the cellist featured in the films. Films screened in the gallery: 'Foxfire Eins', 'Blues in B-flat', 'Projection 1' and '591/2 seconds for a string player', versions 1 to 3. 'Nuit Blanche' International Film Festival Paris, is a 'white' evening when galleries and museums across the city stay open for the entire night. 'Strong Women: Vikki Amedume' was part of a programme of works by London based women filmmakers projected from the gallery Miss China Beauty Room, Les Halles, Paris, into the street outside. Curated by Lucy Reynolds. Regional tour of works shown at the The Times bfi London Film Festival 2005,'Experimenta' programme. Tour dates between April and June 2006. Programme Stationary Dances' curated by Miranda Pennell for TTV Preforming Arts on Screen festival, Bologna, Italy. 'Séance for Maya Deren', group screening and panel discussion introducing the Maya Deren season 'Maya Deren: 50 Years On' at the British Film Institute, South Bank, London. With chair and curator of the event, Elinor Cleghorn and film makers Sarah Pucill and Daria Martin. 'Stationary Music' in Mezz#08 Space Memory II - group screening, curated by Louise Fairclough, supported by Stroud Valleys Artspace and the Nunnery. For the first event of the autumn season, Mezz traveled to London (from its home in Stroud) to present an afternoon of artists' films, performance and drawings exploring ideas of memory and its associated place. Presentation of films with talk and audience questions, followed by a performance by free improvising saxophonist Evan Parker. Group screening of films by women centred around gender and a re-definition of 'punk' in the digital age. Organized by Marianna Ellenberg. 'K. ', 'Cold Jazz', 'The Whirlpool', 'Foxfire Eins', 'Projection 1', 'Blues in B-flat', 59 1/2 seconds for a string player', retrospective screening at Jeonju International Film Festival, South Korea. Interview and Q&A following screening and speaker in international conference: 'Stranger than Cinema' - discourse between Cinematic Structure and Narrative Form. Choreographed by Anthony Howell, accompanied by John White’s melodic palindromes and directed by Jayne Parker, 'The World Turned Upside Down' is an episodic dance of bizarre inversions and reversals between people and dogs. Are the dogs performing for the people or are the people performing for the dogs? 'The World Turned Upside Down' is a ‘Dance for Camera’ film, commissioned by the Arts Council and BBC and produced by Sally Thomas for Maya Vision International, broadcast on BBC2 9 March 2002.